Those who subscribe to empiricism believe that we should not believe the truth of some X based on a competent authority. We are only justified in believing some X if we have empirically verifiable evidence supporting the truth of X. It goes without notice that this principle itself is not empirically verifiable, and thus empiricism is self-refuting as a complete theory of knowledge. But let’s ignore the man behind the curtain for a moment, and explore other deficiencies in an empirical epistemology. In his book, A Universe from Nothing, physicist and empiricist Lawrence Krauss describes the state of the cosmos in the distant future. Due to cosmic expansion, in two trillion years all of the evidence for the Big Bang (cosmic microwave background, redshift of distant objects/the Hubble expansion, and the measurement of light elements in the cosmos), and all 400 billion galaxies visible to us now, will no longer be detectable via empirical methods. Worse yet, all of the evidence for the dark energy that caused the cosmic expansion will be gone as well. For scientists living in that day, all of the empirical evidence will point to a static universe inhabited by a single galaxy that is no more than a trillion years old (based on the ratio of light elements at the time). What should these future scientists do if they happen to come upon a cosmology textbook from the 21st century claiming that the universe was created in a hot Big Bang 14 billion years earlier (which would be make the universe more than double the age our future scientists would have calculated based on the amount of light elements in their day), and the universe contains hundreds of billions of galaxies, and hundreds of trillions of stars? None of this could be verified empirically, and these claims would actually contradict their own empirical investigation of the universe. Would they be justified in believing what we said about the universe? Would they be justified in ignoring their own observations in favor of ours, or would they be foolish to listen to ancient claims from people far less intelligent than themselves? Given an empiricist epistemology that focuses on empirical verification before accepting a truth claim as true, I don’t see how they would be justified in believing such things about the universe. And yet, if they rejected these claims on the basis that they were not able to personally verify these ancient claims empirically, they would be led to reject the truth in favor of falsehoods. Such is the deficiency of an empiricist epistemology. I find application to this scenario in the resurrection of Jesus. Those who witnessed the life, death, and resurrection of Christ appealed to empirical evidence for their claims, and yet, similar to those scientists living two trillion years from now, it is beyond our ability to empirically verify their evidence today. Like the future scientists, however, this does not make it irrational for us to believe in the resurrection of Jesus. We believe in the resurrection based on the testimony and evidence supplied to us by those who were in a position to receive the evidence when the evidence was available, even though we are not able to verify that evidence empirically today because it is no longer available to us, just like future scientists should believe in the cosmology described by today’s scientists based on the evidence they acquired when such evidence was available, even though future scientists will not be able to verify that same evidence empirically in their own day. Epistemological verificationism is a valid epistemology that is capable of justifying many true beliefs, but it is not the only valid epistemology. An exclusive appeal to epistemological verificationism will, at times, lead one to reject the truth (e.g. all of history would have to be rejected). We need to be open to the truth claims of those in a position of authority to know the truth, even if we are unable to empirically verify their evidence in our own day. That’s the odd thing about “justification” in epistemology. Usually it’s little more than deontological (“thou shalt”) appeals to heuristics we’ve found useful. But, as you correctly point out, heuristics can occasionally lead astray. This also leads to the question: what has been lost (if anything) during the 13.8 billion years since the Big Bang that would further increase our understanding of how Cosmos was created? How can we claim anything about Cosmos to be scientifically verified without knowing if anything has been lost (meaning becoming unobservable) since then? And just who were these people? There is no eyewitness account, as you know, and the evolution of the Jesus stories from Mark to John shows tremendous increased sensationalism and innumerable conflicts. The only NT author we are sure of is Paul and he was not an eyewitness. I won’t debate these issues with you again as has been done often on your site, but wishful thinking that you know the truth about what happened in the Holy Land 2000 years ago is just that….wishful thinking. Very good question. Krauss raised the same issue. There could be natural phenomenon that would elucidate or correct our present understanding of the universe, that is no longer available to us. This goes to further show that the inductive methods of science can never lead us to certain truth, but can only tell us what is probably true. Yes, there are eyewitness accounts. Matthew and John were eyewitnesses. The Gospel of Mark was based on Peter’s testimony (Mark was a travelling companion of Peter), and Peter was an eyewitness. Though Luke was not himself an eyewitness, he tells us in his prologue that he interviewed eyewitnesses for his account. I don’t buy the notion that the Jesus story evolved from Mark to John. Just because John does not cover the same stories as the synoptics (which we know were all related to one another, since Matthew and Luke used Mark as the basis for their own gospels), and do not share the same emphasis, does not mean there was an evolution. It just means there is a lot to tell about Jesus, and no one author told all there was to tell. Indeed, according to church tradition the reason John decided to write his gospel was to make up for the deficiencies in what the synoptics covered. Paul was an eyewitness of the resurrection. He personally encountered the resurrected Jesus. I have to wonder, given your historical skepticism, do you believe anything history books tell you, or do you assign them all to wishful thinking? Your points to Kerry concerning the resurrection of Yahshua are well taken. The NT writings aren’t an evolution; they’re an integration which provide a full picture of Messiah. The Four Gospels + The Acts of the Apostles + The Revelation serve as a cohesive coherent compilation to unveil our Redeemer as the Suffering Servant of YHWH and the Absolute Judge. Matthew Chapter 28 presents testimony involving irrefutable witnesses to Messiah’s Resurrection, namely, “some of the watch” of Roman soldiers assigned to guard the sepulchre. I refer you to the Youtube video entitled, “The Shroud of Turin: A Scientific View / A lecture by Paul Bromley detailing the findings of STURP (The Shroud of Turin Research Project); filmed in the late 1980s.” Mr. Bromley applies a unique well-informed perspective to elucidate this very subject. You are confusing science with irrefutable statements from a putative divinely revealed text with unknown provenance. Every statement in science must be refutable. If you make a statement “a human was resurrected from the dead without use of technology,” that is an extraordinary claim which demands extraordinary evidence. Under the circumstances, an identical twin could have convinced any number of eyewitnesses that it happened. Any number of other uninvestigated ruses could have convinced any number of witnesses as well. Eyewitness account is not the extraordinary evidence that is required to validate the claim. It is an effect and not a verification. I know there is a slim chance of getting a response on this but I am going to ask anyways. At what point does empirical evidence no longer become empirical evidence? Is there a point where you can show evidence that contradicts 50 years of schooling and teaching that something is real but you know a way to disprove it but it is not taken seriously. If you can prove it by empirical evidence, when does that evidence no longer matter if theory outweighs facts? 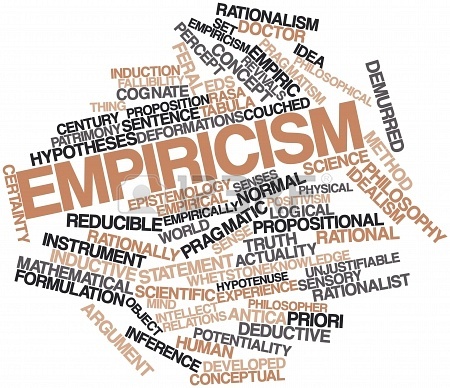 “Empirical” describes the type of evidence, so empirical evidence will always be empirical. What I think you mean is at what point do people no longer care about the empirical evidence because they are more committed to a particular theory or philosophy than they are the facts (when philosophy trumps data). If so, I think that happens frequently. The debate over biological evolution is a prime example. The data and empirical evidence is against Darwinism, and yet people continue to believe in Darwinism because they are committed to atheism or a materialistic vision of science. My next question is if you had empirical evidence that would turn science on to a new path, and have had trouble getting the experiment out there. Would it be worth perusing if it disprove one of the fundamental beliefs in science? Definitely. And according to scientists, they often say the goal of science is to disprove current theories. Of course, that’s what they say. They don’t always mean it, of course. Many of them have staked their careers on trying to prove certain theories to be true. Their reputation, grant money, and/or teaching post is at stake. Scientists are not dispassionate, objective observers like try to portray themselves. We all have a bias. What if by one simple experiment you could disprove something like gravity? Would you propose the experiment? Because remember gravity is just a theory and has never had any empirical proof of it’s existence, and only hypotheses and what else could it be proposed. If it could empirically prove where that concept is 100% wrong, would that be an anomaly or what? And would you be willing to take the experiment for what it is? I don’t know that that is a good example since gravity cannot be disproven (we know it’s real); only particular theories of gravity can. The empirical proof of its existence is our experience of it. What we may have wrong, however, is what causes it. A better analogy would be those living in the days prior to the discovery that earth is rotating on its axis and revolving around the sun. That theory contradicted the common experience and perception of motionlessness. But people came to accept the theory because the data proved it true. Gravity, a small force that is somehow magic in how it appears and works. I have tried to think of every possible way something can be created out of nothing, and how one force can somehow change into another. It does not appear at a small level, be it the dust particles that made up the universe so many, many, many years ago. But it somehow magically changed one force of nature into another. Either I am totally lost in the idea or the concept of how one force can be changed into another force or it cannot be done. It is the concept of when you have enough mass; the mass changes the electromagnetic field into gravity. At what mass does this occur? One pound? One ton? One billion tons? What is the magic number that causes the electromagnetic filed to alter and become gravity? If you cannot tell me, then how do you know it happens? They are simple questions and not very hard to understand, yet for some reason there is no answer. If there is no answer to those questions, how do we know it happens? I have heard that if you drop a brick it will fall. Can you name anything on Earth that does not have metal of some type in it? Some would say gas. Well that is a funny thing, gas. It has electrons and protons and neutrons. Is gas electrically charged? Yes. How does it behave in an electromagnetic field that relies on a positive and negative charge? Is it dispersed or does it tend to stay close to that field? Science has never been able to determine this because of the general fact; Earth has an enormous electromagnetic field that reaches to the moon at least. What else? Nothing, from the water that runs in our oceans to the trees and the fruit that grow on the trees, everything has metal in it in some form or fashion. Is it possible that one force gives way to another or is it that one force can change into another? Well, that is a bit of a slippery slope. Can thrust change from thrust into momentum? Let us say in general that this is not possible, because with thrust you always have momentum meaning that the object speed will always try to keep up with how fast it is going. Let us also go and say the object is approaching light speed, or has achieved it. Would thrust be altered into momentum or could it still accelerate even faster? And thus would it give way to a force that was there and was part of the equation to start with? Most would agree that they are two very interdependent forces. The force of an object to increase speed would always remain thrust and never change. The force to keep the speed would be momentum and that would never change. Yet both are very reliant upon each other to achieve movement. But both are not considered the same even a 1 light-year per nanosecond. So if two completely different forces are always completely different and equal, how is it possible for a force to come into existence out of nothing? If the force was not there to begin with, at what point would this force be real? Is it something that can be proven? I am sure you are aware of a child hood experiment that you were told was a joke by science, yet science does not have an answer as to why this empirical proof that gravity does not exist. Here is the experiment in detail and the heck with the numbers because the empirical proof is the fact you can see it with your own eyes and have it tested and retested again and again with the exact same results. 1)	Take a series of balloons be it two or three or four. 3)	Fill each balloon with the identical or close enough to exact weight, within less than a difference of an ounce. 4)	Leave the first balloon as to control and do not add any static charge to the balloon. 5)	Charge each of the following balloons with increasing static charges meaning that balloon 2 has a field and balloon 3 has double that field and so on. 6)	Talk a water source and run it by the water close enough but not close to wet the balloon. 7)	Repeat with each of the following balloons and notice the difference, with each of the static fields increasing in charge. 8)	The results you will get will always be the same. The balloon with just the mass has no effect on the water. The next balloon will show a pull on the water. And as the field increases, so does the pull. Here is why this experiment is so valuable. First off it not only proves that even with a minor static charge in a magnetic field like that on Earth, it has a pull. It also provides evidence that mass by itself has no pull. Since after all the static of the charged particles is being blocked by the rubber of the balloon. This is empirical evidence that mass has no effect and the effect that is observable is because of a static or electromagnetic force. As shown in the example above with the thrust and momentum, they are both measurable even on the smallest scales. It does not alter or change from one to the other or vise-versa. If this force as gravity is nothing and does not exist even in the smallest of scales, how can it appear? That goes against the very idea that something cannot be made out of nothing, unless physics is wrong. The concept of gravity is that the Earth’s electromagnetic force somehow transforms into a new force, gravity. Yet nothing else in physics can change from one force to another. The concept of something created by this force created or even the transfer of energy from one type to another has yet to be proven on a planetary scale or even on a small scale that can explain as to exactly when this happens; or even if it is possible to change the electromagnetic force of an atom or group of atoms into a gravitational force. It is known that when you transfer energy from one type to another, you lose something in the process. It has never been proven that the electromagnetic field has lost anything from this transformation. Yet, gravity would have you believe that the electromagnetic force from an atom that has gravity and it is so small, it is immeasurable on any scale and only appears when you reach a massive or super massive size. Not possible as the force between thrust and momentum as used in the example above. It should be able to be calculated at the atomic level for this force to exist and not hypothesized. It should be measurable on this level, but either by a lack of or current ability to detect it, or by the reason that it does not exist, we currently cannot measure this force except by hypothesizing that it exists and should be there. By the proof so far that a force so small that it by any means is immeasurable but we are able to figure out there are more than just electrons, protons and neutrons in an atom. We currently can tell the mass of atoms and the charge they have and how many electrons are there. We can measure the weight of gasses. Yet we cannot figure out how to measure a force of gravity that an atom has and can only hypothesize what it should be. What if this gravity is the miss-classification of the electromagnetic field that we can measure on an atom at current time? What if the electromagnetic field is being miss-classified on purpose to make us chase our tails in trying to locate the unifying theory between the supper massive and the atomic level? Remember in the example above, how momentum and thrust are so closely related it would appear that in order for thrust to operate, momentum would not be valid. They are so closely linked that it takes the removal of thrust to prove momentum. But does that invalidate momentum? In order to prove gravity, you would have to completely remove the electromagnetic force, and at current time, there is no way to remove the force. Problem comes in with Pluto. At some point in the orbit it is close enough to have an atmosphere. That atmosphere is cause by the sun that is way far away, but has the ability to charge and warm the ground above what it was and to cause the atoms to move and cause the surface to heat up. Earth is a lot closer and that is how the Earth maintains the electromagnetic force on Earth or any planet closes enough to the sun to have dust, dirt, or gases in the atmosphere. They rub into each other and cause static electricity and add to the electromagnetic force that has been built upon by years of this activity. Therein lays a big problem because anything closer to the sun then Pluto is on the farther point on its orbit will be effect by the sun. At current time in order to prove that it is not the electromagnetic force is not being miss-classified as gravity and to show gravity would exist, it would have to be tested on something further out then Pluto and at current time we have nothing that far out; especially not something to detect a gravitational force, and not something big enough to test it on, to our knowledge. So we are left at one point and one question, at what point does the electromagnetism of atoms, change over to gravity, what mass?